A spray foam roof offers superior protect for businesses and other properties that have flat roofs. The seamless surface keeps out water, and the thick foam offers better insulation than other roofing types. These are great properties in the monsoon-prone Arizona. The extreme heats during the monsoon season will bake buildings, making the AC work overtime, and the strong rains and winds can easily tear off shingles and other roofing materials. Many spray foam roofs have a roof membrane that provides an extra layer of protection. It is a thin piece of plastic that forms a watertight seal. When a strong monsoon comes through, it can blow twigs and other debris onto your roof, which can catch on the membrane and rip it. The force of blunt objects like rocks or lawn furniture can also rip the membrane. Report any rips that you see to a roofer as soon as you can to schedule a repair. Rips that are allowed to remain can let in water, which can further damage your roof or the rest of your property. The top coating of your spray foam roof is your first line of defense for your property. A strong storm can cause that coating to rip, which can decrease your property’s energy efficiency and leave it vulnerable to water damage. You should check your roof after each monsoon to ensure that there are no cracks in the roof coating. As with a rip in the roof membrane, you should report any coating cracks to your roofer right away for repair. Flashing is the material that connects items like chimneys and vents to the roof. The flashing ensures that water does drain down the side of the vent and seep into the tiny cracks where it meets the roof. Unfortunately, flashing is also the first thing that is usually damaged on a roof, and it can leave the roof and your property vulnerable to damage. Check around items like HVAC units, vents, and fans for signs that the flashing has become loose or damaged. Better yet, hire a roofer to do this check for you. A roofer will know what signs to spot and will be able to conduct the check safely. You don’t have to get on a ladder or climb on your roof for this one. You just need to walk through your building and look at the ceiling. Check for signs of water spots, which may appear faintly yellow, grey, or brown, depending on where they are. Water should never be pooling on your roof. If it is, that’s a sign that your roof is no longer draining properly. Standing water can weigh down the roof and can wear away at the materials, eventually leaving the roof vulnerable to damage. You will have to get on your roof to check for signs of pooling water after a storm, so be sure to be careful. As always, it’s best to hire a roofer to do this check for you safely. Even if a monsoon does not seem particularly harsh, you could have damage to your roof. It’s important that you either check for signs of this damage yourself or that you hire a professional roofer to do the inspection for you. Leaving this damage untended can allow more damage to your roof or your property. That will result in much more expensive repairs, and it will shorten the life of your roof. 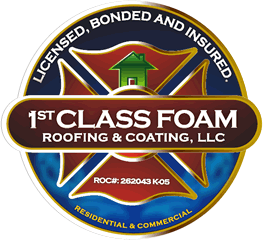 First Class Foam Roofing and Coating can help you protect your spray foam roof in Arizona. Our spray foam roofing specialists can inspect and maintain your roof to extend its lifespan and ensure that it continues to protect your property. We offer roof recoating and application. We also install polyuria linings, walk decks, and more. Contact us to help us protect your roof or to talk about other ways we can help you protect your property.